I'll document the extravagant to the basic clean room with service that goes above and beyond! Tucked away in Downtown Seattle in the city's retail and financial center, Hotel Vintage Park is a wonderful historic gem. Washington being home to more than five hundred wineries, it is now the nation's second largest wine producer and is ranked among the world's top wine regions. Kimpton turned the property into a freshly updated hotel with old world charm encompassing the wine theme. As you enter the quaint lobby, you are greeted by a friendly staff full of smiles and eagerness to please. I arrived earlier than expected and not only did they have a room ready, but they decided to upgrade me to a suite since I was a InTouch Kimpton loyalty member. 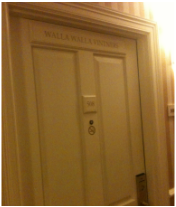 As I walked from the elevator down the corridor to my room, I noted that every single room had a name, one that was named after a Washington winery. The William Dacon Room awaited me and upon entering, I was emerged in an elegant room similarly decorated to the lobby. The dark burgundy color scheme mimicked the wines associated with the theme. This is a fantastic warm place that I could envision visiting during the Christmas holidays. They did a phenomenal job of tastefully implementing white lights to add to the festive atmosphere. Upon sitting on the bed, I felt like I was in a little piece of relaxation bliss. 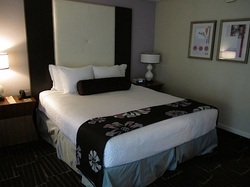 The pillows and mattress were extremely comfortable allowing me to anticipate a wonderful night’s sleep. I lounged around for awhile planning out my sightseeing for the evening. Before venturing out, I decided I needed to freshen up. The bathrooms are fairly standard other than their shampoo/conditioner/soap products which are mounted on the wall. I actually appreciated not having a small re-filled bottle for once and instead an ample amount of wonderful smelling bath products. 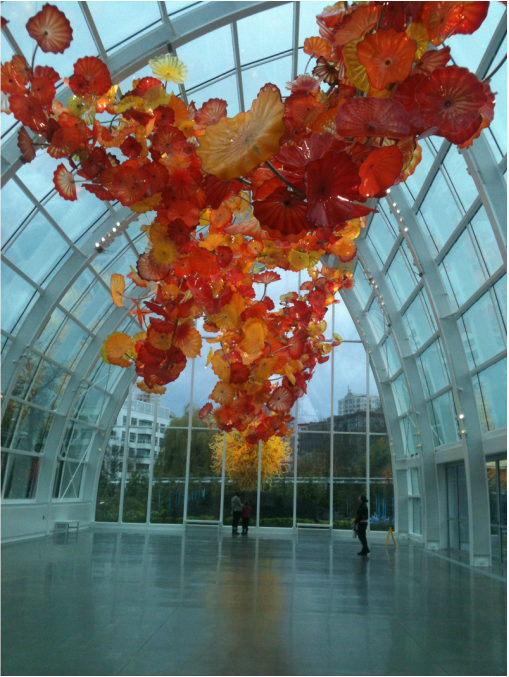 After this I headed over to see the Chihuly Glass Museum (read about this here!). After an inspiring night of art, I returned to the hotel just in time for their wine social hour from 5-6pm. As usual, Kimpton did not disappoint. The evening featured local Tsillan wines produced about 3 hours outside of Seattle in Chelan, WA. They served a 2008 dry Riesling – of which I learned they sold a majority of recent harvests to Chateau St. Michelle for their premiere blends – and a Syrah blend. Both wines were a wonderful start to the evening and I highly suggest you check Tsillan out if you are ever taking a Washington wine tour! As you can see from their brochure picture to the left, it is a beautiful property to visit as well! They recently expanded their chateau and tasting room to accommodate more visitors and add an increase in wine production. The owner and winemaker was present during the event to help share all of his pride and joy. After enjoying the wine and company, it was time for dinner, so I chose to eat right there at their award winning restaurant Tulio. My choices of the burrata and beet salad, veal chop, and pistachio semmifreddo were phenomenal. I would rank the flavor combinations and presentations as ranking in the top 20 dishes I have ever had (read more about my experiences at Tulio here). With my tummy full and after a fantastic rain, I collapsed into my soft bed and fell straight to sleep. I can only imagine if my experiences were so fabulous over one night, the experiences you could have here for a few days could be breathtaking. 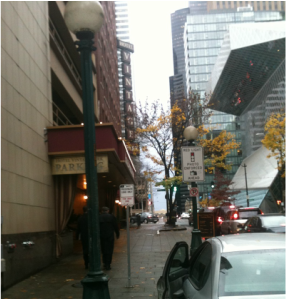 Make sure that you put the Vintage Park hotel on your list of places to stay when visiting Seattle! Let Us Stay With You: is the tagline associated with staying at a Ritz Carlton. Let us take your eyelids back in time. Let us re-create the recipe from your favorite meal in Paris. Let us help you unwind without leaving the city. Let us turn a weekend of pampering into a memory you'll be reminded of at every turn. When you talk about opulence, the Ritz Carlton Dana Point is the poster child for their corporate marketing campaign. Their premise is to focus on guest experiences and the memories that guests will remember for years to come. The moment you set foot onto the property you are transported to a world of pristine beauty, relaxation, and luxury. The lobby area, completely constructed of marble and lined with fresh cut flowers, gives you a feel of elegance. As you walk further inside, you pass by a plethora of dining options including a fine dining restaurant EnoSteak, Bar Raya in the center of the building, an express bistro named the marketplace, an upscale bistro named Raya, and the 180 Blu outdoor terrace lounge. At almost all of these locations you are greeted by a wall of windows with a million dollar view of the Pacific Ocean. During my stay, I was fortunate enough to experience one of the ground floor rooms - with a walkout patio overlooking the ocean and a fireplace to enjoy the cool nights. We were thoroughly impressed by the attention to detail from the wall decorations and architectural details to the marble bathroom with jack and jill sinks. I could imagine this room being a wonderful retreat or romantic getaway for even the most demanding guest. After dropping off our luggage and changing out of our work attire, we chose to venture down the the 180 BLU, one of four bars and eateries on property. This open air restaurant and lounge offers one of the best views of the Laguna/Dana Point areas due to its elevation and uninterrupted line of vision. which had a very unique twist: the add popcorn to the top! 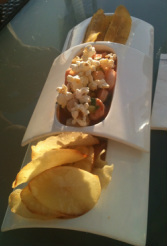 The ceviche was composed of aji panca panca popcorn sauce, rock shrimp, bay scallops, calamari, roasted corn, cucumber, red onion, and cilantro. We were given plantain chips and paper thin potato chips as our serving utensils making it a very fun experience. We agreed that it could use a different variety of seafood since there was an overwhelming amount of tiny shrimp that seemed perhaps frozen beforehand, but the taste was still very pleasant and we appreciated this to start. After sitting for another hour enjoying the ambiance, we decided to order their special of the evening, which was their sushi. 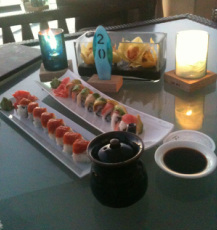 Their selection was pretty standard, but they delivered high marks in presentation and the freshness of the fish. To make the entire experience even more breathtaking than it already was, a musician soon walked in carrying his peace sign music stand and guitar. This long haired blond gentleman depicted the stereotypical California beach surfer and was talented to boot! He played acoustic guitar all night long singing classic and modern songs from artists like Coldplay, Jack Johnson, John Mayer, Sting, and Oasis. We requested songs all night long from his list he brought with him hoping he would continue the entertainment all night long. In fact, I kept hoping I would still be able to hear him from the patio of our room, but the sound didn't carry out that far. To keep us happy all night with the cooling temperature, the Ritz staff walked around passing out fleece blankets to bundle up and stay outside. We graciously accepted them and spent one more hour into the evening listening to the music and breathing in the fresh ocean air. When we were finally ready to depart, we happily walked back to our room and started our fireplace. (I've included a daytime shot so you can visualize the amazing surrounding and setup!) Shortly after our arrival to the room, there was a knock at the door and a gentleman hands us a large plastic tube full of ingredients - which I soon realized was a smores kit! If you've read my post on the Kimpton Firesky, then you already know how excited I was to find another hotel focused on you enjoying every aspect of your stay. We grabbed the tube, went straight out to the patio, and started the fireplace. And that's where I sat for the rest of the night listening to the ocean and eating smores sandwiches. After feeling satiated, I fell asleep with the patio doors wide open to the ocean. I slept better that night than I had in days, probably due to the wonderfully comfortable beds and the sound of the ocean. In the morning we called down to room service and requested tea, coffee, and a beautiful sunrise. Although the staff quickly asked what kind of "sunrise" we wanted, they quickly understood our joke and laughed along with us. Talk about a staff aimed to please! 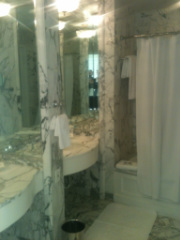 So, we wrapped up our wonderful time at the Ritz and left feeling refreshed and invigorated. I highly suggest that if you ever make it out to the area, try to stay here, or atleast make a pit stop at the 180BLU and enjoy the wonderful atmosphere. You will be transported to a place or serene beauty with a staff ready to provide anything you desire. When choosing a hotel most of us business travellers log onto our company travel site, choose the cheapest room that also earns us rewards points and book. Make sure next time you choose a hotel, you don't overlook the Kimpton Hotel Group - you can even earn points by joining their InTouch loyalty program. Kimpton has been my favorite chain of hotels since 2003 with my first visit to the Marlowe in Cambridge, MA. Being a boutique hotel, you expect individuality, chic style, and splashes of fun. Kimpton does all this and much more. 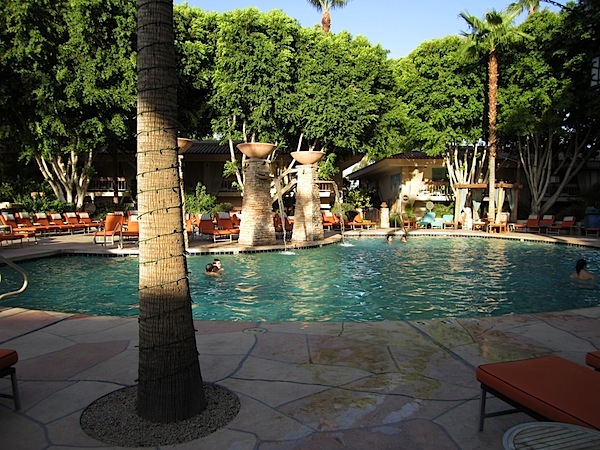 I'll explain how Kimpton make the experience delightful with my recent visit to the Firesky. 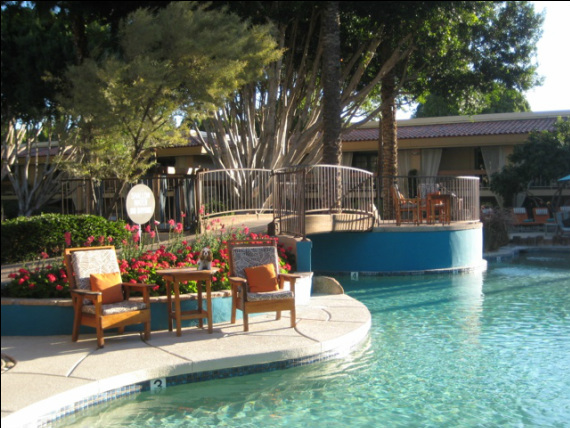 Located right smack dab in the tourist area of Old Scottsdale, this hotel leaves little to be desired for location. It is a short walk to many great eateries, bars, shopping, and commerce. In fact, it is very close to Fashion Square Mall, Arizona's largest mall including many top end luxury brands. What makes Firesky unique from other hotels in the area, however, is that it acts as a full resort with wonderful services and amenities that may have you asking if you really need to venture away from the property at all! As you walk into the lobby, you are immediately overwhelmed by a beautiful fireplace centerpiece. The area is open, inviting, and furnished with modern accents. 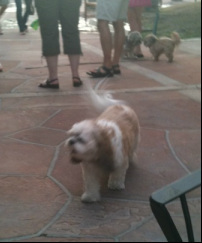 Guests - including those with pets (who stay complimentary) - can be seen roaming around the area or sitting and chatting. To offer a more relaxing setting, Kimpton has always sponsored a complimentary social hour including an array of drinks. Kimpton does a wonderful job at creating drinks that match the local area and upon my arrival, I was offered a prickly pear margarita which was divine! As you walk beyond the fireplace, you are greeted by a large bar and the Taggia restaurant to your left. 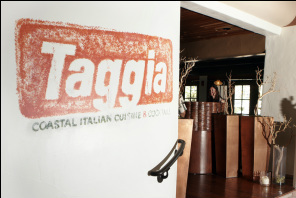 The Taggia offers fine dining options for breakfast, lunch and dinner. 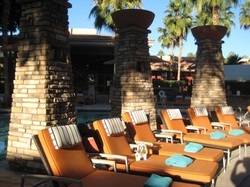 It also hosts indoor and poolside seating allowing you to enjoy the open air. Next stop: walk through the back doors into the magnificent pool area. Talk about ambiance; the grounds are covered by flowers, palm trees, and other shade trees. The main pool is bordered by towering firebowls with fountains pouring into the pool. All you can imagine is fun and relaxation. A sight to see at night! What makes the area more impressive is the expansiveness of the pools, lagoons, seating areas, and gardens. Just when you think you've seen it all with the main pool area, you realize there is more to come. To the right of the main pool is a second pool with a sandy bottom. Although I had no desire to play in the sand, it became an extremely inviting area for families with kids. You could see Kimpton created an easy solution to attract families and business travelers alike. 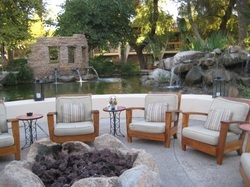 The hotel offers another unique service in their pool areas - the option to make smores at night over the fire pits. What a neat idea that fosters guests to chat, enjoy learning about each other, and enjoy the wonderful Arizona warm weather! Keep in mind, it is very mild here and cold at night from November - April. Regardless of the heat, smores are always accepted in my book. Now on to the reason you are here: the room. 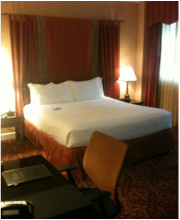 I chose a room with 2 queen beds. Decorated with a fresh, clean look, I was happy to fall into one of the plush mattresses and could have fallen instantly asleep. The staff went to great lengths not to skimp on material and I felt like if I fell asleep I would never wake up. This is the direct opposite to most hotels I visit where I toss and turn all night to the sound of the air conditioner. They also have a great turndown service - I've had everything from chocolate to bubblegum left on my bed depending on hotel location/theme! I also want to comment about the sound between rooms - there was none. I normally am very frustrated about people in the hallways screaming or yelling to all hours of the night, but not here. 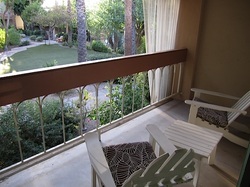 And the best part about it, the rooms were ample size with a balcony overlooking the courtyard. The only remaining area I was not able to test was their spa. I have heard wonderful things about their staff, atmosphere, and actual services, but I have yet to try. So I will leave you here hopefully having a better idea of what a Kimpton exhibits: class, beauty, fun, and relaxing experiences. Keep in mind that every hotel has a different theme and style only making it more fun to visit different locations. My doggie Murphey also appreciates the visits here because he is allowed everywhere, receives a personalized welcome with his name on the board, treats at the desk, room service with food/water - and a pet concierge in case I need to leave for a period of time! So as long as the service and experience continues, I will remain loyal to Kimpton! Foodie and lover of adventure. I travel substantially for work and love to share amazing or unique hidden gems along the way!